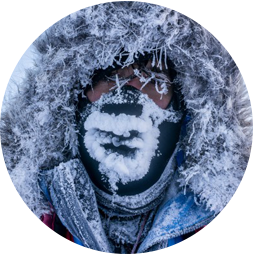 Polar adventurer, expedition guide and dog musher Eric Larsen has completed more polar expeditions than any other American in history and traveled to some of the most remote and wild places left on earth. Included in his long list of accomplishments are the first ever summer expedition to the North Pole; a world record expedition to the South Pole, North Pole and top of Mt. Everest within a 365-day period; and the American unsupported North Pole expedition speed record for traveling from northern Ellesmere Island to the Geographic North Pole.